Derbyshire go into this game knowing that a victory will push them into the top four for the first time this season and, with three fixtures to go, have one of the quarter-final places to call their own. Northants however know only victories in their last games can raise them off the bottom of the North Group by the end of the season. They have nothing but pride to play for, whereas Derbyshire have everything to play for, and will be hoping for a second successive quarter-final place following last year’s impressive campaign. 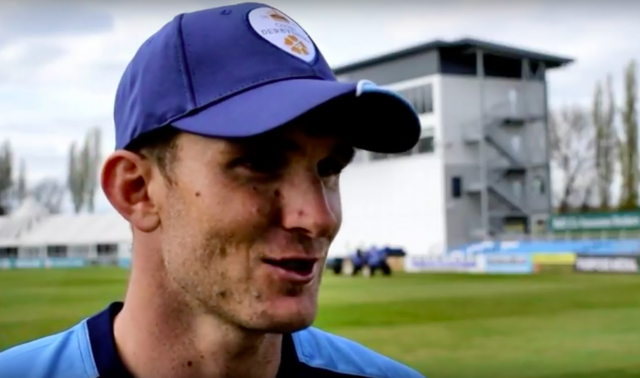 At the start of the season both sides struggled and lost their first four games before the sides met at Wantage Road, where Derbyshire recorded their first victory. Since then Derbyshire’s form has improved massively and have gone on to record four more victories and propel themselves to having a chance of progressing in the tournament. Northants have continued to struggle and have only managed to gain one point from a tied game with Birmingham Bears – the only word to describe their season would be abject. Derbyshire’s leading run scorers have been the ever-reliable Wayne Madsen and Scotland International Calum MacLeod who have scored 607 runs between them at the top of the order and given the side the runs they have needed. The real impetus has been given by four-day skipper Billy Godleman though, who inexplicably did not play the first games, but in the six since has scored 194 runs at an average of 48.50. Two bowlers have taken 14 wickets for the Falcons, Lockie Ferguson and Alex Hughes, both need just four more in the remaining four fixtures to break the Falcons wicket-taking record for a Blast campaign. Northants’ runs have been scored by Ben Duckett, Josh Cobb, Richard Levi and captain Alex Wakely, all scoring over 200 runs, but not 300, no one consistently dominating an attack and scoring enough runs to propel the Steelbacks to victory. Like the runs, the wickets have been shared around too, with no bowler taking over more than seven in the campaign, the only bowlers to take seven being Nathan Buck and overseas star Prasanna. Herein lies the issues that Northants have, not enough runs and not enough wickets. When you make an overseas signing you want them to contribute, you want them to win matches for you and, in Wahab Riaz, that is what Derbyshire have got. So much so they have extended his stay for two further matches. Riaz has taken 13 wickets at an average of 19.54 which is what he was brought in to do, bowling fast and aggressively, both in the powerplay and at the death. However the real surprise for the Falcons has been his batting, promoting him up the order on a number of occasions scoring 131 runs in 6 innings, with a high score of 53. If Riaz can repeat this form against Northants, then the Falcons will be much closer to a 6th victory in the competition. When you are on a bad run of results like Northants are at the moment you need your big name players, your international players, to stand up and be counted and that is what the Steelbacks will be hoping Ben Duckett will be able to do for them. Duckett is a destructive batsman and is the Steelback’s leading scorer in the competition this season with 280 runs at an average of 28. However, he is better than that and when he clicks he can take a game away from the opposition in a blink of an eye or the swish of his willow. Derbyshire will be hoping that his run of poor form along with his side’s continues and they get him early before he can take the game away from them. Derbyshire have named an unchanged 14-man squad from the previous game – in fact the previous six games – and the starting eleven is likely to stay the same too, with Slater, Sharif and McKiernan the men to miss out. This will be Wahab Riaz’s last home fixture before leaving for the CPL and will be wanting to leave the home fans with happy memories of him. The only change could potentially see McKiernan come in as an extra spin option at the expense of either Rampaul or Viljoen. Northants are yet to name their squad, however it will probably remain similar to their previous games. They will be looking for runs from a strong top order of Duckett, Wakely and Cobb and wickets from Gleeson, Sanderson and Hutton. The real jewel in the Northants bowling crown though is Sri Lankan international Prasanna, who adds mystery to their spin bowling and a wicket-taking and match-winning threat. The weather looks set fair for the evening with sunshine and cloud forecast throughout the match and temperatures around 21 degrees. The weather has been dry in Derby for the last week, so expect a dry pitch that will take turn, especially as the match progresses. The pitches so far at the ground have not been the easiest for free scoring cricket, nor have the boundaries with large boundaries square of the wicket. This has made for entertaining cricket however and if nothing else expect the same on Wednesday night.